Open-top double decker bus waiting on the Great North Road near the station. The top deck is empty. Post-war this was the St Albans Co-op grocery shop; I can't say if that was its purpose at the time of the photograph. I believe that this should be "Sherrif's Mill", a corn mill. The Wrestlers Bridge (named after the nearby pub) carrying the then Great North Road over the railway. The bridge collapsed on 20 February 1966 and had to be completely demolished; it was never rebuild for road traffic but replaced with a pedestrian bridge. This field was the site of the new London Transport bus garage which was opened in 1959. This replaced the old 'National' garage over the road. It was a very modern garage and even had flowerbeds I seem to remember. The site is now a housing development. This is the bus garage operated by the National Omnibus & Transport Co. It was built in c1922 to run local bus services on behalf of the London General Omnibus Company. There's a single decker bus at the back of the garage. National Omnibus had a complicated history but basically it was absorbed into London General Country Services in 1932 and became part of the London Transport Country Bus and Green Line Coach Division in 1933. This garage was in use until 1959 when a brand-new garage was opened for London Transport (LT) almost opposite next to the railway. London Country Buses took over the London Transport services in 1970. 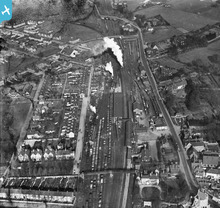 However both bus garages are now history and the sites have been put to other uses. The 1959 garage site is now a housing estate. Anyone remember the old green RT double deckers on the 303 and 303A routes? 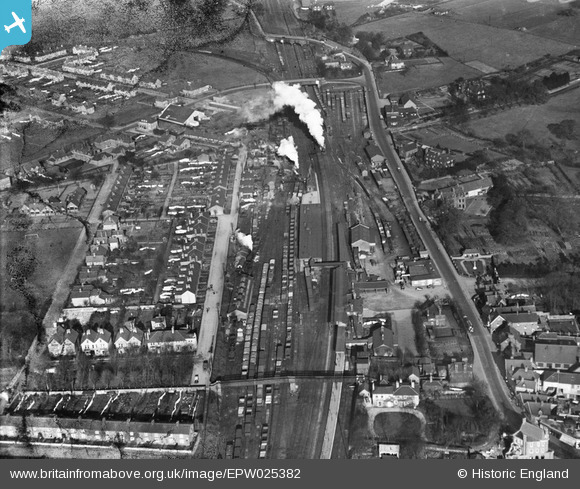 This photo is remarkable for the number of steam locomotives which can be seen. There are at least ten in the photo. Can you spot them? Are there more?